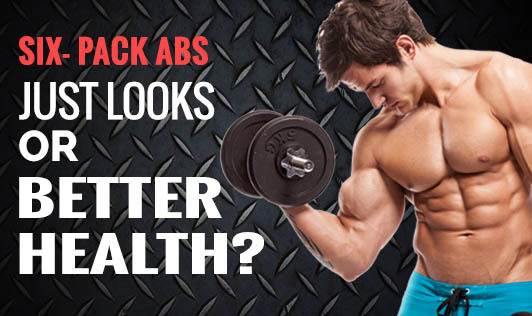 Six- Pack Abs: Just Looks or Better Health? The six-pack abs look package at the gyms is selling like hot cakes these days. Are you also in the rat race to achieve a perfect six-pack abs look? If yes, then go ahead. Six-pack abs not just promises you increased body strength or muscle mass, but they also promise you a few other health benefits. Improved Self Confidence: Washboard abs or the six-pack abs improves your self confidence and self image making you achieve all the so-called impossible! Better Posture: A paunch near your abdominal area obviously means you look shorter than you actually are as you are conscious of your heavier midriff. While you are trying to achieve six-pack abs or have achieved the same, you automatically sit up straight or stand tall and carry yourself well. Better Abs: I hear most of my clients telling, I have a perfect body except my midriff which is my problem area. You can knock that concern with flattened midriff. With your choice of achieving six-pack abs, you are also achieving a better midriff. You can now be more confident while wearing those body-hugging tees that you always wished to wear! Better Health: A slouched up posture brings down the efficiency of your digestive system. Obesity especially around the waist also increases the chances of developing high blood pressure, diabetes or cardiovascular disease. Toned midriffs mean better cardiovascular and digestive health. Say Goodbye to Back Pain: We fail to understand that a heavy midriff not only affects our looks but can also put a lot of stress on the lower back. So flatter abs also means relief from lower back pain. Increased Agility: Don't you think you move like mercury with your flat abs and toned body? Do you now understand that you were taking longer time to get up from chair not because of the age but due to your accumulated fat? You now have the benefit of accomplishing your tasks faster! If you are still trying to achieve the six-pack abs or have already achieved the same, do not stop exercising or eating healthy! Exercise and eat a balanced meal to live healthily and age healthily!